Dissolve yeast in the 3 tablespoons of warm water in the bowl of a food mixer. Allow it to sit for 5 minutes. In a microwavable bowl, mix 250ml of water with 2 tablespoons of milk powder. Heat this mixture in the microwave for 30-60 seconds till it is warm enough to melt the butter. Place the butter in the bowl and stir until the butter melts. Allow the mixture to cool to room temperature – you should be able to dip your finger in it. Whisk the egg and honey into the milk mix and then pour everything over the yeast. Add 510g flour and salt to the food mixer bowl. Attach the dough hook to the mixer and set it on the lowest setting to incorporate the flour into the wet ingredients. Once the flour is incorporated, set the mixer on the second lowest setting (it’s speed 2 on a KitchenAid) and knead the dough for at least 5 minutes. If the mixture is looking quite sticky, add 1 tablespoon of flour at a time till the dough just pulls away from the sides of the bowl. If you’re worried you’ll wear out your mixer, once a dough is formed within the first few minutes, you can remove it from the mixer and finish the kneading by hand (usually for at least 5 minutes). The dough is ready when you push on it with a finger and the dough bounces back quite quickly. Roughly shape the dough into a ball. Grease a bowl lightly with oil and place the dough in there. Cover with cling film and allow to proof for 1-1.5 hours or till it’s double in size. When the dough is ready, prepare a mini loaf pan by greasing the moulds with butter (the pan I use can make 8 mini loaves). Place the dough on a lightly floured bench and cut it up into 8 pieces. You want to be pretty exact with this, so I usually weigh the whole dough on a set of digital scales and divide that number by 8 to figure out how much each piece should weigh. Once you have 8 pieces you need to divide them evenly in half (once again weighing the dough makes it easier to get it as exact as possible). You’ll have a total of 16 pieces of dough before you start shaping. Starting with one piece of dough, flatten it into a rectangle (approximately 12-14cm long). The dough should be placed in front of you with one of the shorter edges closest to you. Fold the left edge into the centre and then the right edge over it. Flatten this rectangle (it needs to be about 6cm wide). Starting from the edge closest to you, roll the dough up like a swiss roll. Place the shaped dough, seam side down, on one side of the mini loaf mould. Repeat with another piece of dough and place it in the same mould, next to the first piece of dough. Repeat with all the other pairs of dough until you’ve filled up all the moulds in the pan. Cover with a tea towel and allow it to proof in a warm place for at least 30 minutes (if it’s cold in your house, it may take up to 45 minutes). During this time preheat a conventional oven to 170 degrees celsius. 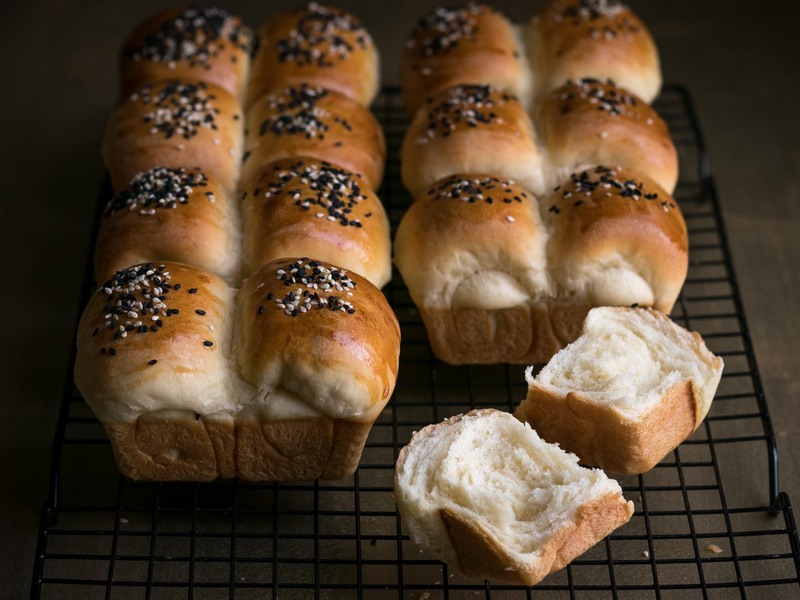 When you’re ready to bake the bread, brush the tops of the dough with the egg wash and then sprinkle sesame seeds over the top. Bake the bread in the oven for 20-22 minutes. I like to check the internal temperature with an instant read thermometer and it should be 88-90 degrees celsius. Allow the bread to rest on a cooling rack till it’s just cool enough that you can handle it. The bread is the best when it’s still warm. If you want to serve it a few hours later or even the next day, it’s best to heat the bread up for 20-25 seconds in the microwave.